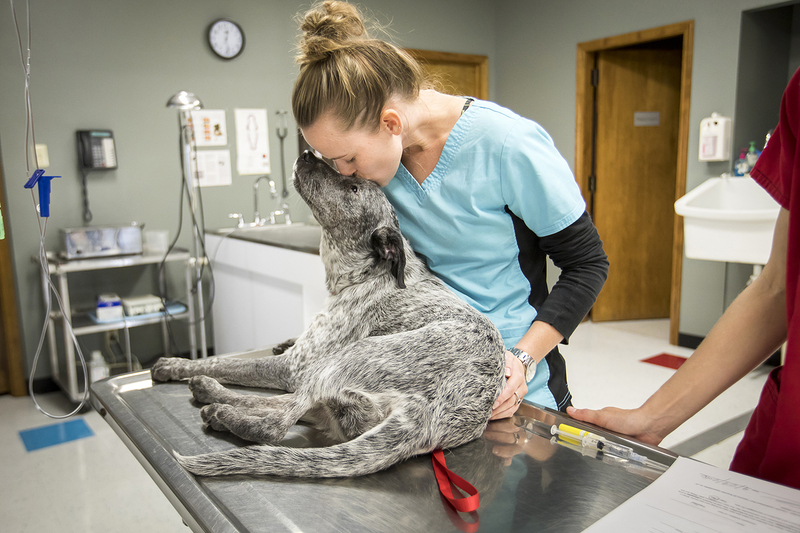 A veterinarian calms a dog. PetSuites, a boarding and grooming spa for cats and dogs, is slated to open its first Baton Rouge location in April, says spokeswoman Rebecca Houser. Groundwork began in 2017 for the 14,000-square-foot facility located on Perkins Road, near Panache Plaza and Southside Produce, with Houser saying “some problems with the city” have extended construction timeline, originally set to wrap in mid-2018. Houser declined to elaborate. The business will feature 7,000 square feet of outdoor yard space, including two animal pools. PetSuites also offers services to cats, with a dedicated play area. This will be PetSuites’ first Baton Rouge location, and the second in Louisiana after the business opened a Covington facility late last year. The Baton Rouge pet boarding market has been in flux the past two years with multiple new businesses opening while established businesses have been either expanding services, closing its doors or selling to a larger national chain. This at a time when consumer spending on pets is increasing nationally. An estimated $72.13 billion was spent on pets last year, up from the $60 billion spent in 2015, according to the American Pet Products Association.